‘Spirit of God’ is the signature piece for the Language of Spirit concept jewellery range. All pieces feature a perfect equilateral triangle symbolising Mind, Body and Spirit or The Trinity. Housed inside is a circle – representing God, no beginning, no end – and encompassing the whole person, the whole of humanity, the whole Cosmos. Within the circle lies a polished crystal gemstone. Unhampered by a solid backing, the stone conveys to the wearer its full energies and blessings as it nestles against the skin. during pregnancy, childbirth, travel and for lovers to arouse tender passions. It bestow calmness and relief from emotional stress. Each stone is set in sterling silver 925 and comes with a numbered Certificate of Authenticity. From early Biblical times, sacred jewellery has always held a special place, embodying as it does, not just mere adornment, but Spirit in its material form. The Old Testament tells us how the twelve sacred gemstones that came from the Mountain of God were given to Moses whose blueprint for sacred breastplate for his brother, the high priest Aaron, is given in Exodus, 28:15-30. Today, the ‘Language of Spirit’ limited edition jewellery collection by psychic intuitive Georgina Walker continues in this same spiritual tradition. Exquisitely elegant, each piece is designed by Georgina and individually handcrafted by some of the finest master jewellers. The true story behind the creation of the Language of Spirit jewellery range is as inspiring and beautiful as the jewellery itself. Moved by Spirit, on a journey to Myanmar (Burma) Georgina came into possession of an ancient Buddhist monk’s prayer box traditionally used in temples. Gazing at the box’s lacquered surface, she was enthralled by its magnificent gold leaf scroll artwork in the form of astrological symbols. Upon returning home with it, Georgina found that something amazing was happening. It was as if this ‘power house’ of energy was transmitting potent energies. In a vision she was shown detailed ancient geometric symbols together with specific colours and semi-precious gems - she was told they were to be used for the enhancement and alignment of the individual’s energetic vibrations so as to achieve their true soul purpose in life. The Language of Spirit Range reflects a sophisticated timeless appeal, with colours radiating a sense of joy for life. Individual pieces are set in sterling silver, complemented by semi-precious gemstones. Each design will receive a numbered Certificate of Authenticity. Resting at first within the ancient prayer box shown below, each piece is imbued with the Spirit of the Divine - its blessings and light energies are then subsequently bestowed upon the wearer. Every piece of Language of Spirit is unique, as no two stones are the same. They are collector pieces. Flexibility is key to the jewellery’s design - the exquisite pendant may be worn on its own, attached to a key ring or added to a bracelet. ‘Spirit of God’ is the signature piece for the Language of Spirit concept jewellery range. 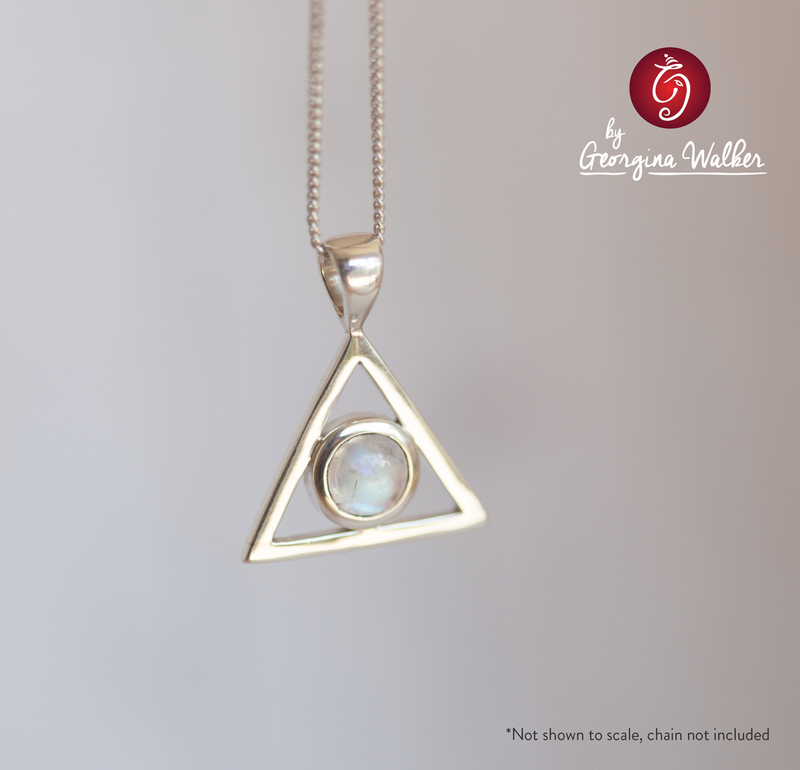 All pieces feature a perfect equilateral triangle symbolising Mind, Body and Spirit or The Trinity. Housed inside is a circle - representing God, no beginning, no end - and encompassing the whole person, the whole of humanity, the whole Cosmos. Within the circle lies a polished crystal gemstone. Unhampered by a solid backing, the stone conveys to the wearer its full energies and blessings as it nestles against the skin. The power of your jewellery can be greatly enhanced by treating it with respect and valuing it as the powerful instrument it is. Should someone else handle your jewellery, it is vital that you cleanse and re-attune it to your own energies. Do this by holding it under clean running water. Dry carefully and place in the sun to re-energise. To preserve the blessings bestowed by your Language of Spirit jewellery always keep it in a safe, protected place.